Under Donald Trump’s tax plan, the lowest-earning Americans get to send a one-page form to the IRS each year saying, “I win.” Another winner in the GOP frontrunner’s tax scheme: corporations. Trump has pledged to lower the corporate tax rate to 15%, “taking our rate from one of the worst to one of the best.” He has also said he would institute a one-time deemed repatriation of corporate cash hoards held overseas at a significantly discounted 10% rate and put an end to deferral on taxes on corporate income earned abroad. Here is where the Trump tax plan moves into the realm of truly unique (genius perhaps?) and pro-American jobs. He is proposing a one-time tax on overseas profits that would be applied to an amount that now exceeds two TRILLION dollars. Companies would have a 10% tax applied to those profits, but several years in which to pay it. The end result would be much of that money would then return back into the United States instead of remaining offshore free from U.S. tax law. And when that money returns, so too will a far greater corporate investment into the American economy which will no doubt create JOBS-JOBS-JOBS, particularly when you combine the above scenario with Mr. Trump’s proposed 15% corporate tax limit. It would be a historic one-two economic punch not seen in generations and would allow the United States to re-emerge as a place that actually makes things and provides near-limitless prosperity potential for those who call this country home. Not only would American companies be returning in droves to do business once again inside of the United States, but foreign corporations would be doing the same. We could realistically see a U.S. economy growing annually at rates of five or even six percent – millions of new jobs, millions of people moved off of government subsidies and living proud, self-sufficient lives that contribute to the betterment of society. The billionaire businessman has also targeted corporate inversion, the practice of U.S. companies reincorporating overseas in order to reduce the tax burden on income. In November, he characterized Pfizer’s planned merger with Allergan in order to relocate its headquarters to Ireland as understandable. “There is no way you can stop it really other than lowering the taxes because right now … it is prohibitive to bring that money in,”he said. 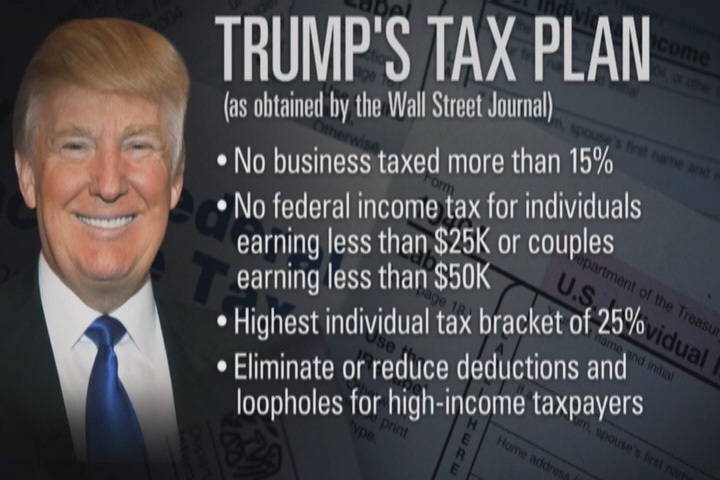 Trump’s tax plan, unveiled in September, would certainly make life easier for corporations. In fact, it might help a lot of people. Virtually everyone would see their tax bills go down under a Trump administration. The highest earners, as with most Republican plans, would reap the biggest benefits, with the top 0.1% getting back 19% in after-tax income while middle-income households would get back 4.9%. Some could recast themselves as a business (like freelancers and the self-employed) to shift from the personal income tax scale’s 25% cap to the 15% business scale, saving themselves some money, too. But there’s a catch: Trump’s tax plan would reduce government revenue enormously, and the federal budget deficit would almost inevitably skyrocket. Nonpartisan tax research group the Tax Foundation calculates that Trump’s plan would cut taxes by $11.98 trillion over the course of a decade. It would lead to 11% growth in the GDP, 6.5% higher wages and 29% larger capital stock as well as 5.3 million jobs. However, it would also reduce tax revenues by $10.14 trillion, even when accounting for economic growth from increases in the supply of labor and capital. “That tax cut would produce faster economic growth and a bigger economy — as long as you pay zero attention to the fact that it would dramatically increase the deficit and budget debt,” said Jim Pethokoukis, a columnist and blogger at the American Enterprise Institute, a center-right think tank based on Washington, D.C.
And therein lies the foundation of the Trump plan – an emphasis on the individual at the expense of Big Government, again a very Reaganesque concept and a direct contradiction to the Obama mentality that believes Big Government is both worthy and wise and thus should be fed with an ever increasing amount of your tax dollars in order to sustain its power over you. Lower taxes. More jobs here in America. Greater freedom.